This course covers the 9 hours of continuing education required by the NMLS and the state of West Virginia perfectly. It is designed to fulfill the 8 hour portion designated by the NMLS, and adds the 1 hour elective portion required by the state. We'll review federal mortgage law, as well as ethics, fraud, consumer protection & fair lending. We'll also look at lending laws for nontraditional mortgage products. 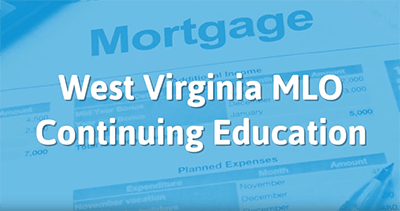 The state specific segment begins with a look at the West Virginia Division of Financial Institutions, which is responsible for oversight of MLOs in the state, along with a discussion of how this state oversight works with federal regulations and the NMLS.